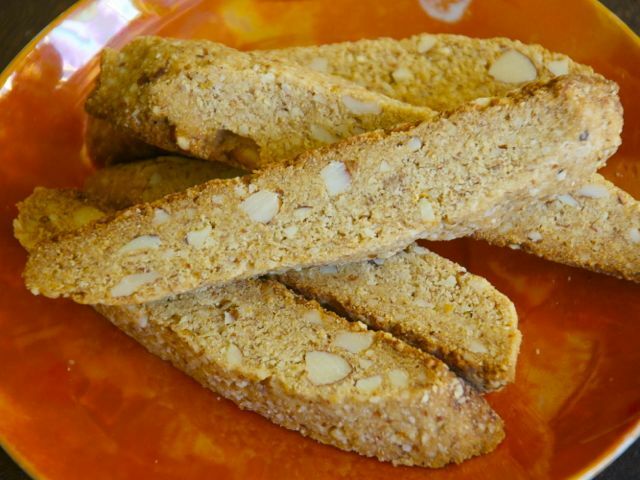 Small almond biscotti are called cantuccini, or "little nooks," in the Tuscany region of Italy. These are honey-sweetened and delicately flavored with almonds in two forms — a finely ground meal \[see Note below\] and whole toasted nuts. Watch these twice-baked cookies closely, as you don't want them to brown too much and lose all their fine fragrance. You will need extra almond meal for the work surface. Whisk together the whole-wheat pastry flour, almond meal, and salt in a large bowl, and then stir in the almonds. Make a well in the center. In a medium bowl, using a large whisk, thoroughly blend the olive oil, honey, vanilla, and lemon zest until thick and syrupy, about 1 minute. Add to the center of the dry ingredients and combine, using a rubber spatula or wooden spoon, just until a soft dough forms. Do not overmix. Cover the bowl with a plate and let sit at room temperature for 30 minutes. Meanwhile, position a rack in the center of the oven and preheat to 300 degrees. Line a large rimless baking sheet with parchment paper. Lightly sprinkle your work surface with almond meal. Cut the dough inside the bowl into four equal pieces. It will be soft, sticky, and malleable. Briefly knead each piece a few times to smooth and form into a log, about 7 inches long and 1½ inches wide — first rolling it between your palms, and then briefly rolling on the work surface. If almond pieces protrude, gently press them in while working the dough. Add more almond meal to your work surface as needed. Repeat with the remaining dough. Place the logs on the prepared baking sheet, leaving about 2 inches in between. Bake the logs until the tops show small cracks, firm up, and just start to brown, 32 to 35 minutes. Remove from the oven, and carefully slide the parchment paper with the logs onto a wire rack to cool for about 15 minutes (or use a metal spatula to transfer the logs if your baking sheet has a rim). Leave the oven on. Transfer the logs to a cutting board. Using a large, sharp serrated knife, cut each log diagonally into ½-inch-thick slices. Return the parchment paper to the baking sheet. Place the slices upright (not cut-side up) onto the sheet. Bake until the cantuccini feel dry to the touch at the cut sides (not on top) and just start to brown at the edges, 15 to 17 minutes. Transfer the cantuccini to a wire rack to cool completely before storing. To get a head start: The cantuccini can be stored in an airtight container for 1 to 2 weeks. They freeze well for at least a month. Almond meal: Almond meal is nothing other than simple ground almonds. Almond meal has become more widely available as bakers cherish its sweet, nutty fragrance. You can easily make it yourself. Place 1 cup whole skin-on almonds (4½ ounces) in the bowl of a food processor fitted with the metal blade and process until finely ground, about 35 seconds. This will give you about 1⅓ cups almond meal. Keep a close eye to avoid over-processing the almonds, as they can turn quickly into an oily paste.